And now, the big man himself. The M.C. introduces Ray Kurzweil with effusive praise, saying he's the reason we're all here. 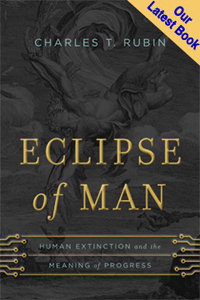 There's certainly some truth to that: Kurzweil's pop-sci books, culminating with The Singularity is Near, have done much to stir up interest in this strain of futurism. He walks out to great applause. A few people try to start a standing ovation; it doesn't take. Kurzweil says he's not giving a formal talk, but just responding to the day's other speakers. He starts off by saying that he doesn't think quantum computing is necessary to achieve Turing Test-level A.I. And he says he doesn't think quantum phenomena are involved in brain processes. But might quantum phenomena be necessary for consciousness, he asks? (That's quite odd: How could they be involved in consciousness but not in brain processes?) He gives a rambling answer — I wish Chalmers, a more lucid thinker and speaker, had tackled this one. 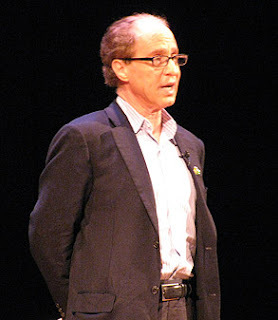 Kurzweil mentions he is working on a book, How the Mind Works and How To Build One, and the audience twitters, in both the old and, I suspect, the new meaning of the verb. Kurzweil responds to Chalmers's point about whole brain emulation. Nobody's claiming, he says, that we're just going to emulate the brain and then, that's A.I., that's it. It's the engineering of it, he says, that will allow us to understand intelligence. This is a claim often repeated by Kurzweil and his followers, but they still haven't outlined how this will happen. Will replicating something at a very low level really necessarily yield its higher-level structure to our understanding? He's really taking on a lot of what Chalmers says, but not doing a great job of it. Mostly he disagrees with Chalmers's claims about how we should go about pursuing the Singularity, and says that some of the questions he raises aren't really important. One interesting new part in here: he says that he disagrees with the claim that philosophical questions are unimportant. If they were, he says, we would have to throw out our whole moral system. Well, he wouldn't want to abet that, now, would he? The rest of his talk is unfocused; he rambles more and more as he goes along. He is just riffing on different things he thought of during the day while listening to the other speakers, but none of it is really new or noteworthy. A lot of it is right out of his book, even down to the phrasing of some of his favorite lines. Many familiar retreads: the massive redundancy of DNA and the brain and its recursive fractal nature; why John Searle is a dummy; the linear versus exponential mindset; the idea that replacing our brain with mechanical parts is no big deal because our brain is already changing and replacing itself all of the time. 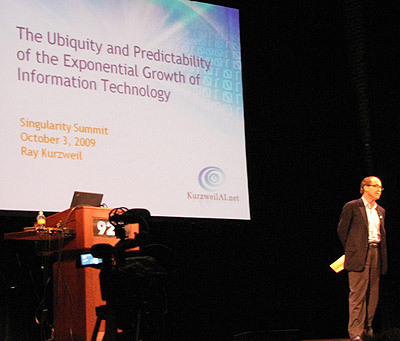 Kurzweil, being the last and most revered speaker, runs twenty minutes over — he's the only speaker to exceed his time slot in what has otherwise been a very tightly-scheduled day. The whole scene strikes me as the king descending after the play to render his judgment before the people. Everyone is rapt, but not because they especially want to know what he has to say. And that's a wrap on the first day of the 2009 Singularity Summit. Later tonight, a retrospective of the day and a preview of what's to come tomorrow.